Our baby had awful colic. He would only stop crying if I did a jig with him in my arms while we played Paul Simon’s “The Obvious Child” at blasting volume. At a year old, he started producing toxic waste. One day, I was away from home and Martha texted me a picture of our little fellow standing in our living room, wearing only his diaper, which was overflowing. There was extra overflow on the rug, more on the walls and even more covering his arms, from his hands up to his elbows. Martha accompanied the picture with just two words: Crap Gloves. I could feel through the phone all the work my wife had to do to clean up. I could feel her exhaustion and her fear that she’d never get back to her photography career. But in the middle of all that, she wanted me to laugh. Martha and I met at a reading; only because Martha nervously introduced herself. Her face was shock-red with shyness. To calm her blushing, she fanned her face so hard with a program that she got a paper cut on her temple, which I was so forward as to dab with a cocktail napkin. By a year into dating her, I’d learned the depths of her shyness (when her doorbell rang, she’d often hide). When we got engaged, she explained about the night we met. She wasn’t very religious, but she’d been sitting in the audience and I’d come out on stage and she’d heard a Voice—some Voice from outside herself, something absolute—that said, “This is the man you’ll spend the rest of your life with.” It is only because she heard this Voice that she took what was for her the monumental effort of saying hello to me. It is my favorite brave thing she’s ever done. Martha and I got to Venice once and went running the first afternoon. It was 60 degrees, the sun was shining, but as we tramped over bridges, past gondoliers and trattorias and around pedestrians, I kept complaining about the crowds, wanting to go faster. I was also wrangling over a screenplay I was writing and some tough plot points I needed to get past. Martha finally stopped me and grabbed my chin and said, “David. Look around.” She indicated our stunning surroundings. Then she looked me in the eye and said, “Pass the test.” She could have said, “Smell the roses.” But “Pass the test” slapped me awake a lot more quickly. Martha grew up a country girl. 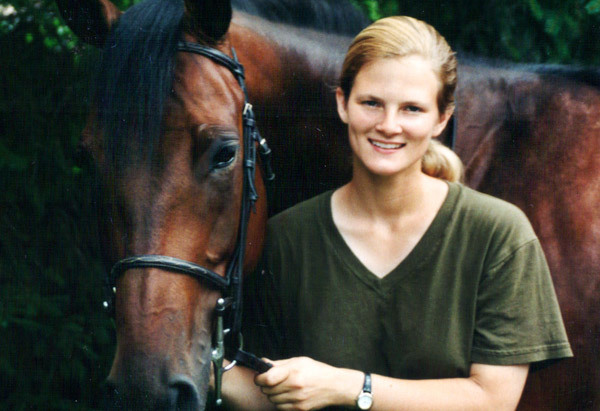 As an adult, she saved up and bought her own horse, Riley. He adored her, and before she met me, he was how she spent all her time. She (and then we) kept him at a stable outside of town. A few years ago, on Christmas Eve, we got a horrible phone call: Riley had walked out of his front left foot, breaking his leg. Riley would have to be put down within half an hour. Martha and I raced out to the stables. I drove while she wept. It was dusk when we arrived. Martha made herself stop crying before we got out of the car. Way off in the distance, far from the barn, Riley stood in a snow-covered pasture. The stable owner and vet were already with him, ready with the syringe. Riley kept upright, despite his mortal lameness. I could see, even from afar, the misery on his face. I shouted loudly across the pasture to the vet, who waved back, knowing to wait for us. Riley made no move at my voice. Then, my wife, at my side, looking at her beloved animal 200 yards away, spoke his nickname—”Ry”—under her breath. From as far off as he was, Riley heard her immediately. I saw the pain on his face lighten. He reared, whinnying to her a call of love more resounding than I’d ever heard from him before, raising his crippled leg to signal her. He stood out against the dying sky like that, and for a moment I felt what he felt, the same thing I’d felt on that beach in Kauai when Martha appeared across all that distance from me and hailed me out of my fear. She is here. She is with me, always. I will be all right. It is very, very touching. I may track down his book and read it. Thanks for sharing! He has 2 out. I just ordered used copies of them today for less than $10 for both!